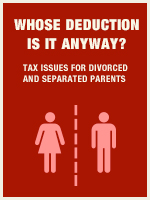 This course is not intended as a comprehensive analysis of all the tax issues that arise in the context of divorce or separation. Many of the tax issues that may arise need to be dealt with in a planning context, before a divorce or separation agreement is finalized. Rather, the objective of this course is to review the issues that are most likely to confront the return preparer whose clients are already divorced, separated, or otherwise not married to the other parent of their children. Expiration: In accordance with NASBA standards, access to this course will terminate one year from the date of purchase. Incomplete courses will no longer be accessible beyond the one year deadline.